If it's the cream of Peruvian textiles you seek, you'll be remiss to skip PeruModa, an annual trade show in Lima that showcases the best of the country's apparel, footwear, accessories, and jewelry. 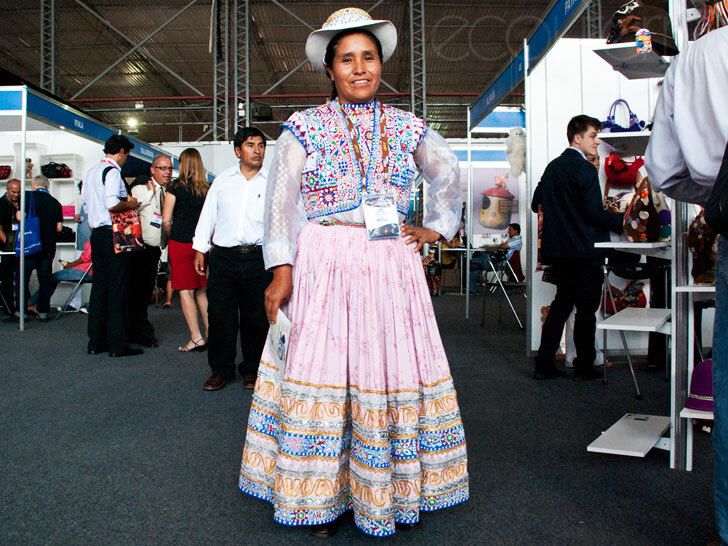 Held this year alongside the Peru Gift Show and Lima International Fashion Week, the exhibit featured 350 artisanal collectives and businesses, many of which showed off their traditionally honed expertise in fibers such as alpaca wool and pima and native cottons to their best advantage. Ethical fashion hasn't so much taken root in Peru as it has never left. Ecouterre paid a visit to the textile event of the year to scope out the goods in person. Meandering through the hundreds of booths was not an easy task but several designers caught our eye. 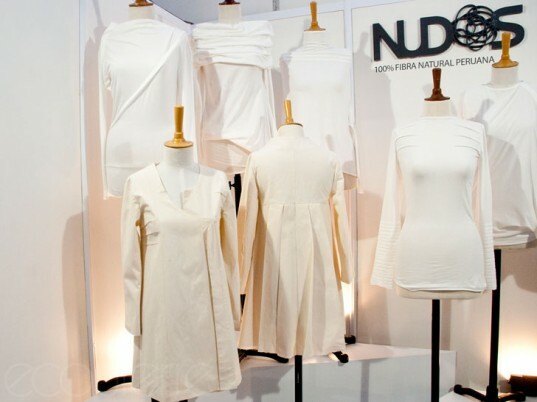 A series of white tops made from 100 percent Peruvian natural fibers drew us to Nudos. Designer Maria Luisa Negri typically follows the tradition of classic couture creating custom made pieces. However, for Nudos, she has created a prêt-à-porter collection that is defined by pleats. Inspired by humans experiences and feelings, the collection focuses on wrinkles as a metaphor for life. By mimicking wrinkles using pleats, the tops are transformed from traditional long-sleeved shirts to ones that fit the form and add new exciting, elements such as a poncho-like sleeve. Although the majority of what was on display was white, the designer discussed the possibility of working with buyers to use natural dyes to create more color variations. From cotton to Peru’s abundance of alpaca, knitwear designer Naty Muñoz and others have developed the Asociación Peruana de Diseñadores Especializados en Tejido de Punto (APDETP)- The Peruvian Association of Designers Specialized in Knitting. Various members of the group were on hand to show their work and talk about the association. 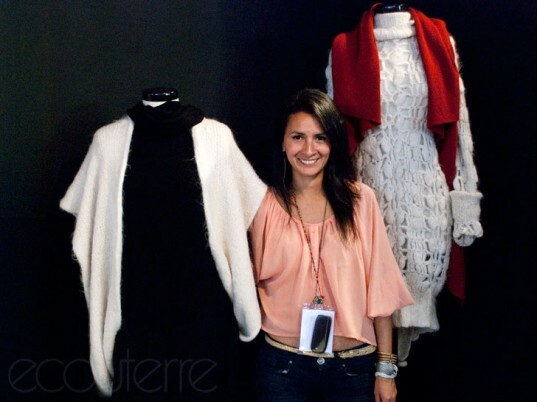 Run as a nonprofit, APDETP includes members with over 10 years of knitwear design experience who are working to elevate the creative and technical offerings of Peruvian knitwear. They work directly with designers to help them improve not only their skills and designs but also to learn how to run a business and market their finished products to an international audience. Jessica Salazar Luna, owner of Killa Knits, was also on hand to share a secret: she will launch her collection of handmade knits from Peru next year at PeruModa. Based in Lima, Nunalab offers a variety of accessories and home goods made from upcycled material, mostly industrial cotton scraps. The group works with a variety of artisan groups and nonprofits to create high-quality handmade products that use long-practiced craft work techniques to meet current trends. For its efforts, Nunalab received the 2011 Business Eco-Efficiency Prize from the Peruvian Ministry of Environment. Muqu by Chio Lecca presents an array of jewelry made from repurposed wood and other natural materials. Drawing inspiration from the beauty of Peru’s natural resources, the company uses seeds, native woods and alpaca wool to create unique, modern styles. 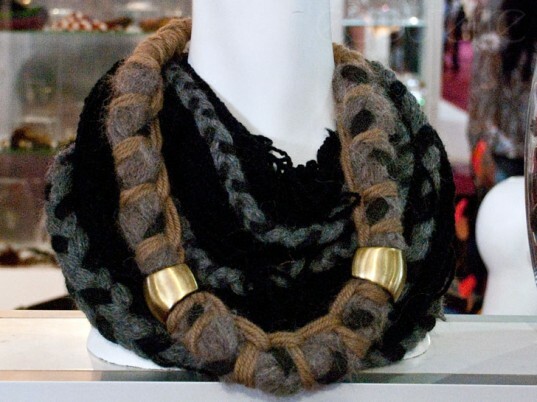 Chunky braided necklaces fusing all three materials were among our favorites. Although just a small taste of the various exhibitors who participated at PeruModa, it was obvious that national designers are working from a variety of angles to appropriate ethical fashion in a Peruvian context and share it with the world. Whether working with pima or native cottons, alpaca, or other fibers, designers are creating exciting collaborations that fuse traditional techniques with modern trends while keeping the environment in mind. Tallerqata, an atelier in search of "simple, meaningful design." Cariluis alpaca by Grethel Gonzales Sierra of Cusco. 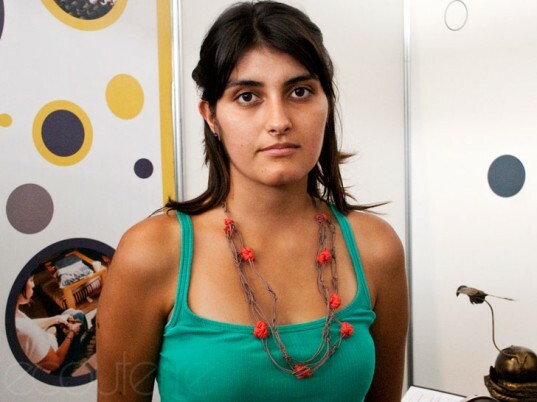 Naty Muñoz of Asociacion Peruana de Disenadores Especializados en Tejido de Punto (APDETP). Dress on by Giancarlo Gallo (left) and Karina Giannoni. Nudos by Maria Luisa Negri. Kidswear, made of pima cotton, organic cotton, and alpaca, by Roxan Lo. Horseriding ponchos, made of pima cotton, by Klaud.